Marvin Gaye was an American singer, songwriter and record producer who helped to shape the sound of Motown in the 1960s. On the anniversary of his birth, April 2, 2017 I painted this portrait after hearing a song dedicated to him the night before. Throughout the 2 hours it took to start and complete the painting, I felt a powerful spirit within me, guiding my hand. It wasn't until after finishing the painting that I found out it was the late artist's birthday. Jay Golding is a Fine Artist based in Essex County, New Jersey. He received his Bachelors of Fine Art from Kean University in 2015. 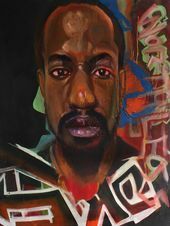 Golding has participated and curated a number of exhibitions, solo, group and juried in the greater Metropolitan area. He is also a muralist, who has contributed several public works to the City of Newark, as well as overseas.